Download a blank fillable Az Form 34-1 - Agr Application Supplement in PDF format just by clicking the "DOWNLOAD PDF" button. Complete Az Form 34-1 - Agr Application Supplement with your personal data - all interactive fields are highlighted in places where you should type, access drop-down lists or select multiple-choice options. 1. Have you ever been convicted of a law violation other than a minor traffic violation? If yes, please explain on reverse. 2. 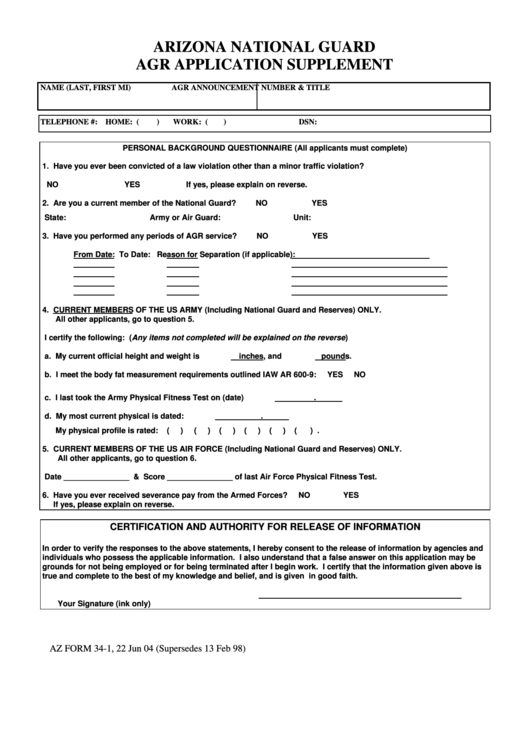 Are you a current member of the National Guard? 3. Have you performed any periods of AGR service? 4. CURRENT MEMBERS OF THE US ARMY (Including National Guard and Reserves) ONLY. All other applicants, go to question 5. 5. CURRENT MEMBERS OF THE US AIR FORCE (Including National Guard and Reserves) ONLY. All other applicants, go to question 6. Date _______________ & Score _______________ of last Air Force Physical Fitness Test. 6. Have you ever received severance pay from the Armed Forces? true and complete to the best of my knowledge and belief, and is given in good faith.